Mawenzi tarn camp is a campsite located near the base of Mawenzi, one of the three peaks of mt. Kilimanjaro. Its name comes from its proximity to a tarn. 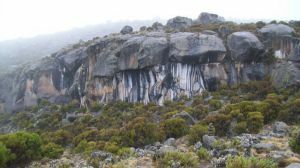 The campsite is small and mostly used by ascending climbers on the Rongai route, a route that is seldom used compared to the rest. 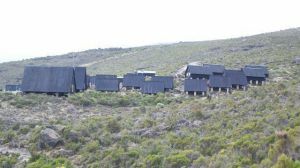 Accommodation at the campsite is mostly in tents with toilets in the form of shared pit latrines. Unlike other high altitude camps on the mountain, there is some water at the campsite, that is provided from the nearby tarn(although not drinkable). Mawenzi tarn camp is located at the base of Mawenzi and also north of it. It is also next to a tarn, one of the few, if not the only one on the mountain. 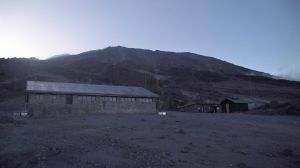 Its location next to Mawenzi makes it viable for the few climbers with permits to summit Mawenzi, however for those on the Rongai route, it is the second last before reaching the summit. Are you associated with Mawenzi Tarn campsite? Contact us to improve this page or create another page for your business.